C&L Supreme is a family owned business that has built its 50-plus year history upon the basic values of honesty, trust, quality, service, and value. Our company was founded by Louis Spizziri in 1957, as Supreme Manufacturing Company. Sons Philip and Peter joined the company in the early 1960’s, and are still with the company today. The young business was primarily engaged in job shop machining and producing automotive aftermarket components. In 1972, the company acquired C&L Screw and added screw machine components and gear blanks to its production activity. Shortly thereafter, the names Supreme Manufacturing and C&L Screw were combined and the company began operating as C&L Supreme. The course of its manufacturing technology was altered in 1983 when the commitment was made to aggressively develop CNC machining capabilities. In 1999, the Company moved its operations from Chicago to its current facility in Des Plaines, IL. 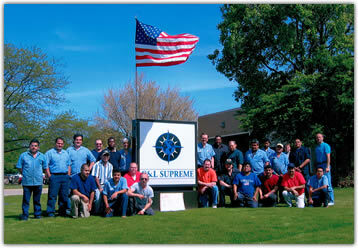 We at C&L Supreme believe you will find our straightforward approach to business quite refreshing. We appreciate the opportunity to provide valued service to you and your company.